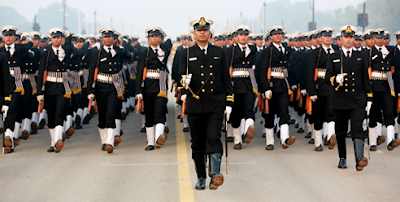 Hello Aspirants, We have a good news for you as Indian Navy as announced recruitment Applications are invited from unmarried Indian citizens for grant of Permanent Commission (PC) and Short Service Commission (SSC) in following branches/Cadres in Indian Navy for the course commencing Jan 2018 at Indian Naval Academy (INA), Ezhimala, Kerala. Checkout the complete details and apply for the eligible posts on or before 9th April 2017. Short Service Commission. Candidates inducted under short service commission will be granted the commission initially for 12 years extendable further for two years. The candidates will be issued call up for Services Selection Board (SSB) based on their performance in Degree Course. 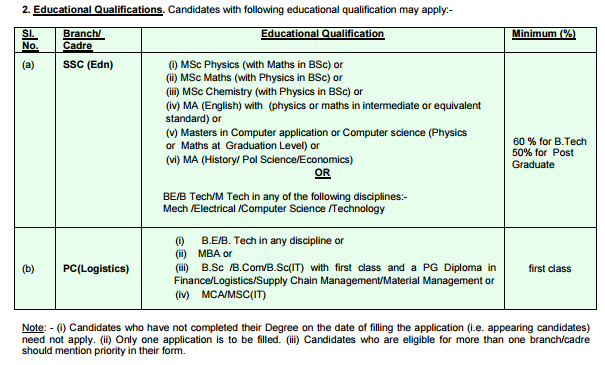 If a candidate possesses higher qualification with better percentage, his higher qualification will be considered for cut off. Integrated Headquarters, Ministry of Defence (Navy) reserves the right to shortlist applications and to fix cut off percentage. No communication will be entertained on this account. SSB interviews for short listed candidates will be scheduled at Bangalore/Bhopal/Coimbatore/Visakhapatnam during Jun - Oct 16. Candidate can submit only Online (e-application) for this entry from 19 Mar 16 to 09 Apr 17. (a) Click on the ‘Officer Entry’ button under the option 'Apply Online' on the Home Page. (d) Before clicking the Print Application button it should be checked whether all the details entered in the form is correct as you will not be able to make any corrections after saving the record. Candidates can take the print of the application form by entering the relevant details. (e) Before clicking the instructions for SSB Button, it should be checked whether all the details entered in the form are correct as you will not be able to make any corrections after saving the record. Candidates can read the instructions on conduct of SSB by clicking on the instruction for SSB button and can take the print of the application form by entering the details from the download sections under officer entry. (f)Print two copies of the online Application Form having the system generated Application Number. (g) Paste recent passport size colour photograph at the space provided and self attest the same. (h)One copy of this Application Form is to be duly signed and mailed (posted) to Post Box No. 04, R K Puram Main PO, New Delhi - 110 066 along with the following documents:- Self attested photograph, Self attested photo copies of 10th & 12th class certificates along with Mark Sheets, other educational certificates and mark sheets of all semester/years. 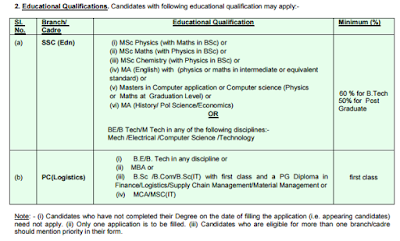 In case CGPA, candidate is required to attach certificate issued by the University for Conversion of CGPA in to percentage. Application to be sent by ordinary post only. Speed post/courier and Registered post will not be accepted. (j) A superscription is to be made on envelope: ONLINE APPLICATION NO. ________ APPLICATION for PC (Log)/SSC (Log & NAIC) JAN 2017 COURSE Qualification______ Percentage _____%. NCC ‘C’ Yes/No. NOTE; Application and requisite enclosures must be properly tagged/stapled; IHQ MoD (Navy) will not be responsible for loss of enclosures, if sent loose. Education officers are responsible for imparting instructions onboard Training Ship’s & Establishments. Avenues to specialize in Metrology & Oceanography/ Naval Communication/Anti Submarine Warfare/ Gunnery/Navigation & Direction/Hydrography /IT and M.Tech Courses are also available. Education officers will also be responsible for control and co-ordination of schooling/Libraries/Academic facilities, Distance Education, Naval examinations (On/Off line), development of Training Design and Evaluation and Human Resources. Logistics officer deals with the Logistics aspects of men and material. He/She plays vital role in the human aspect of the ship/establishment‘s organization. A modern warship irrespective of its role needs a continuous supply of fresh provisions, fuel and spares. You as a Logistics officer will be responsible for smooth supply of stores to all naval units. In no other career does an officer get such a vast exposure to keep abreast of modern and latest development in the field of management and finance.